Rainy days can seem kind of gloomy, but we think it’s a great opportunity to use the imagination! Yes, you and your child can have so much fun in the rain if you just take a different perspective on the weather. Instead of seeing it as a drab drizzle outside, you can see the watery outdoors as an underwater adventure. 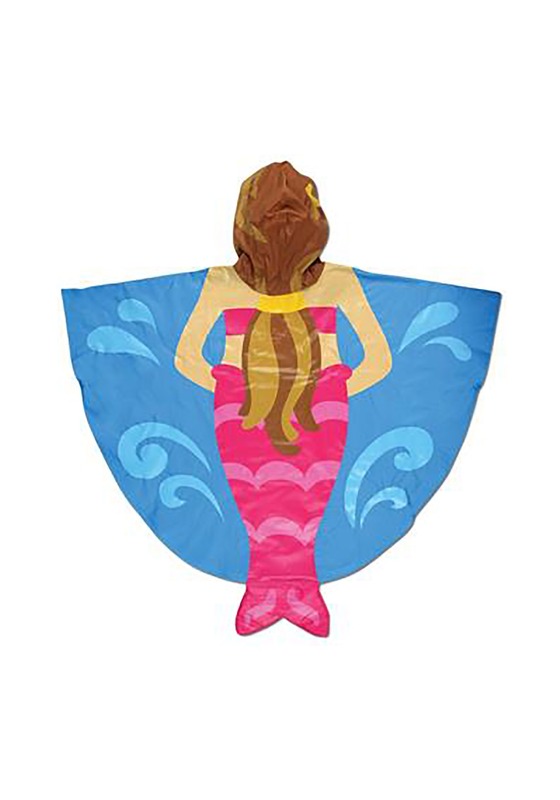 Of course, Stephen Joseph is here to help that imagination out with this Mermaid Rain Poncho! This adorable rain gear is designed to help your child feel like an aquatic creature during the next rainy day. The poncho is made out of a sturdy, waterproof PVC material and fits with a hook and loop fastener in front. The poncho is 24 inches long and has a 32-inch wingspan. It has an attached hood to help keep your child’s head dry during the rain and the front and back have an illustrated image of a mermaid’s body! This cute rain poncho acts as a great way for your child to play in the rain! They can pretend that they’re a mermaid adventurer heading out into the deep sea to discover new depths. It’ll turn that gloomy rainy day into a quest for discovery.